My favorite Pie Crust! You would never know it’s Gluten-Free! When I made this pie crust for the first time, I was hooked. It was easy to prepare, rolls out well and tastes amazing! I don’t think I will ever make another pie crust again, especially since my boyfriend requests this one! Note: To make the non gluten-free version, just substitute all purpose flour instead of gluten-free flour and omit the Xanthan gum. This pie crust it wonderfully flakey, and melts in your mouth. If you are someone like me, who enjoys sneaking a taste of uncooked pie crust, the gluten free version is not taste good because of the Xanthan gum. Combine the flour and xanthan gum and mix well. 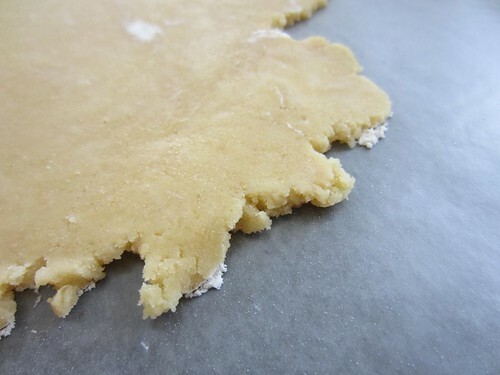 Add the shortening and use a pastry cutter to blend the shortening into the flour until it forms small pebble like crumbs (Note that the gluten-free version will produce a very Play-Doh like consistency at this point because of the xanthan gum). Lightly beat an egg and add it to the flour and shortening. Next add cold water and then distilled vinegar. Lastly, add the salt. Mix together using a wooden spoon just until combined. Cut the dough in half, placing each half in a Ziploc bag. 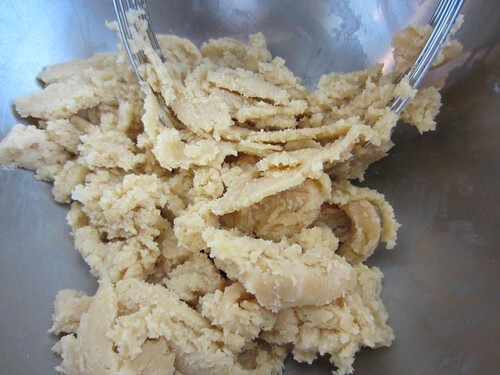 Using either a rolling pin or the palm of your hand, gently pat the dough out to form a circle. Each bag will make one pie crust. Put in the Freezer for at least an hour, I prefer to freeze mine overnight. When you are ready, remove the crust from the freezer and let it thaw for at least 15 minutes. I find this dough works best when cold, so no need to wait too long. If you are looking to make only the bottom of a pie crust, then only remove one of the crusts from the freezer. 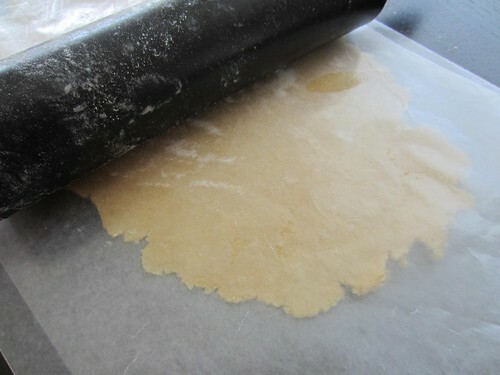 I prefer to roll my piecrust out between two pieces of wax paper and coat each side of the crust with flour, because the gluten free piecrust can be sticky and can crumble easily. I have a hard time picking it up from the counter top without something underneath it. Otherwise I suggest using a very generously floured surface. Roll the dough from the middle-out, until you reach your desired thickness. If the dough gets too soft, I put it back in the fridge for a little while. When you have rolled it out, use the wax paper to flip the pie crust into your pie plate. Pinch edges using your fingers or a fork to form a decorative edge. Add your fillings and bake according to your pie directions. Let me know what you think. It truly is the “perfect pie crust”! Hey! Hopefully you see this by tonight. I have a gluten free flour mix that includes guar gum. We forgot to pick up some xantham gum and the distilled vinegar. Would this heavily affect the consitency? Or would it still be good? Hi there unfortunately I am not familiar with the flour. Sorry! No worries. I just went out and bought it. I’m going to be using it elsewhere, so I just did it. The way it turned out – it probably wouldn’t have worked the same without the xantham gum.